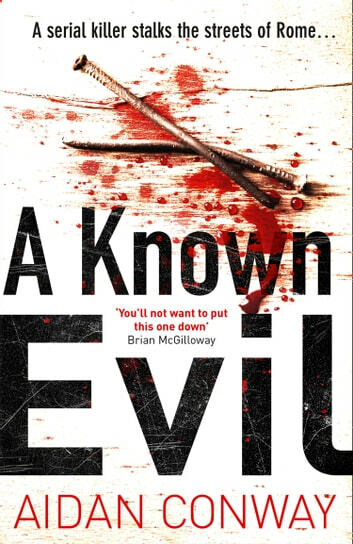 A serial killer stalks the streets of Rome… A gripping debut crime novel and the first in a groundbreaking series, from a new star in British crime fiction. Perfect for fans of Ian Rankin. A city on lockdown.In the depths of a freakish winter, Rome is being torn apart by a serial killer dubbed The Carpenter intent on spreading fear and violence. Soon another woman is murdered – hammered to death and left with a cryptic message nailed to her chest. A detective in danger.Maverick Detective Inspectors Rossi and Carrara are assigned to the investigation. But when Rossi’s girlfriend is attacked – left in a coma in hospital – he becomes the killer’s new obsession and his own past hurtles back to haunt him. A killer out of control.As the body count rises, with one perfect murder on the heels of another, the case begins to spiral out of control. In a city wracked by corruption and paranoia, the question is: how much is Rossi willing to sacrifice to get to the truth? This was a somewhat enjoyable thriller. I liked the characters, but the story tended to be super slow. It was hard for me to finish the book. But I did, and it did have a few twists in it. I voluntarily read and reviewed an advanced copy of this book. All thoughts and opinions are my own. I grew tired of the characters as I felt the descriptions of everyone and everything dragged on. I felt as though nothing substantial happened in the story until Chapter 63 or so. Even the few following chapters were just OK, even though I was surprised at the outcome. I didn’t care for the author’s style of writing. Many of his sentences were clipped but many of them were long without proper commas inserted. I had to read some of them twice to see where the emphasis or the break in meaning occurred.